Český Těšín (Czech pronunciation: [ˈtʃɛskiː ˈcɛʃiːn] ( listen); Polish: Czeski Cieszyn, German: Tschechisch-Teschen, Hungarian: Tessény) is a town in the Karviná District, Moravian-Silesian Region of the Czech Republic. The town is commonly known in the region as just Těšín (Polish: Cieszyn). It lies on the west bank of the Olza river, in the heart of the historical region of Cieszyn Silesia. Until the 1920 division of the region between Poland and Czechoslovakia it was just a western suburb of the town of Teschen, which after the division fell to Poland as Cieszyn. The combined population of the Czech and Polish parts of the city is around 60,000 (25,000 in Těšín, 35,000 in Cieszyn). 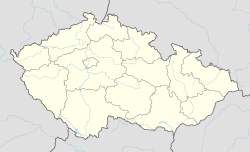 Until 1918 the area was called Sachsenberg (local dialect: Sasko Kympa) meaning Saxon Hill, and was a small western suburb of the town of Teschen (Polish: Cieszyn, Czech: Těšín) in the Duchy of Teschen, within Cieszyn Silesia of Austria-Hungary. Following the fall of Austria-Hungary, Czech and Polish local governments were established. Both of them claimed that the whole of Cieszyn Silesia belonged to Czechoslovakia or Poland respectively. To calm down the friction which developed, the local governments concluded an interim agreement on division of the area running along ethnic lines. The division line imposed by the interim agreement was seen as unacceptable by the central Czechoslovak government, mainly because the crucial railway connecting the Czech lands with eastern Slovakia was controlled by Poland, and access to that railway was vital for Czechoslovakia at that time. Despite the division being only interim, Poland decided to organize elections to the Sejm (Polish parliament) in the area. Czechoslovakia claimed that no sovereign rule should be executed in the disputed area before a final solution was found, and requested that the polls not be held in the area. The Czechoslovak request was rejected by Poland and Czechoslovakia attacked the Polish part of the region on 23 January 1919 and forced Poland, which was at that time at war also with the West Ukrainian National Republic, to withdraw from the larger part of the area. After a ceasefire, both sides agreed to hold a plebiscite, which never took place, as the atmosphere in the region remained heated and turned violent. The entire area was divided by the decision of the Spa Conference from July 1920, thus in practice creating a Zaolzie area, leaving a sizable Polish minority on the Czech side and dividing the town of Cieszyn between the two states. The town Český Těšín was then the center of Český Těšín District, existing in the years 1920–1938 and 1945–1960. In 1938, following the Munich Agreement allowing the German annexation of the Sudetenland as signed by the United Kingdom and France in accordance with their policy of appeasement, Poland coerced Czechoslovakia to surrender the region of Zaolzie (including Český Těšín), by issuing an ultimatum to that effect on 30 September, which was accepted by Czechoslovakia on 1 October. Following negotiations with Czech authorities, who were given an additional 24 hours to evacuate the area, Polish troops and authorities entered it on 2 October 1938, and the territory was annexed by Poland as Cieszyn Zachodni (West Cieszyn). After the German invasion of Poland in 1939, the entire territory was annexed by Nazi Germany. During World War II it was a part of Nazi Germany. In 1941, Nazi Germany established the camp Stalag VIII-D here. After the war, the 1920 borders were restored. In 1849, the western part of Teschen was home to only 14.9% of the town's total population: in 1880 24% and in 1910 33.4%. Teschen was known for its national and cultural diversity, consisting mostly of German, Polish, Jewish and Czech communities. There was also a small but lively Hungarian community in the town, mostly officers and administrative workers. According to the Austrian census of 1910, Teschen had 22,489 inhabitants, 21,550 of whom had permanent residence there. The census asked people for their native language, 13,254 (61.5%) were German-speaking, 6,832 (31.7%) were Polish-speaking and 1,437 (6.6%) were Czech-speaking. The most populous religious groups were Roman Catholics with 15,138 (67.3%) followed by Protestants with 5,174 (23%) and the Jews with 2,112 (9.4%). In 1938, there was a sizeable Jewish minority in the town, about 1,500 in Cieszyn and 1,300 in Český Těšín. Nearly all of them were killed by Nazi Germany in concentration camps. Most of the synagogues were destroyed. Today, only one synagogue still stands in the town, used as a Polish cultural centre. The Jewish cemetery in Český Těšín is abandoned. The sizeable German community fled, or were expelled, to Germany after the war. There are no Jewish or German communities left in the town today. Today the Poles comprise a minority in Český Těšín, as 16.1% of the town's population, although the number of people with Polish heritage is considerably higher. The town is an important cultural and educational center of the Polish minority in Zaolzie. The number of Poles is however decreasing as a result of continuing assimilation. Although a border town, there is no longer any real ethnic tension between Czechs and Poles. Alongside several Czech primary schools and one gymnasium the town has both a Polish primary school and a gymnasium. Těšín Theatre has Czech and Polish ensembles, where plays are presented in both the Czech and Polish languages. Together with ensembles in Vilnius and Lviv it is one of the few theatres outside Poland which has a professional Polish ensemble. The town is a centre of commerce, including the paper industry. The diversity of the town is not only ethnic, but also religious. Many Christian denominations are present in the town. In the past a large Jewish community lived there. According to the 2001 census there are 14,860 believers in the town (56.2% of the population), out of whom 8,916 (60%) are Roman Catholics, 737 (5%) Czech Brethren, 356 (2.4%) Jehovah's Witnesses, and 1,709 (11.5%) others, mainly Lutherans. The oldest sacral building in the town is the Empire style chapel from 1848, located near the cemetery. The Neo-Gothic Catholic Sacred Heart of Jesus Church was built in 1894 by Viennese architect Ludwig Satzky. After the division of the town of Teschen in 1920, there were no Lutheran churches in Český Těšín. In 1927 the local German population built a Lutheran church in the town, and in 1932 the second Lutheran church was built. The church of the Evangelical Church of Czech Brethren was constructed in 1929. There is also a Kingdom Hall of Jehovah's Witnesses, prayer house of the Apostolic Church and several other prayer houses in the town. There were four synagogues or Jewish prayer houses in Český Těšín before World War II. The oldest one had existed since the beginning of the 20th century. It was run by the Schomre Schabos (Guardians of Shabbat) society. In 1928–1929 the society built a new synagogue on Breitegasse Street. It is to date the only synagogue in the town which still stands. Nazis did not destroy it due to its proximity to other residential buildings. In 1967 the building was bought by the Polish Cultural and Educational Union (PZKO). The Maschike Hatora (Upholding the Law) Orthodox society built its own prayer house on the Felix Dahn Street shortly after the Schomre Schabos synagogue began operating. In 1931–1933 a prayer house was built on the Friedrich Schiller Street but was burned down when Nazis entered the town on 1 September 1939. See also: Category:People from Český Těšín. Cicha, Irena; Jaworski, Kazimierz; Ondraszek, Bronisław; Stalmach, Barbara; Stalmach, Jan (2000). Olza od pramene po ujście. Český Těšín: Region Silesia. ISBN 80-238-6081-X. Cicha, Irena (2003). Okolím beskydského průsmyku / Okolice beskidzkiej przełęczy. Český Těšín: Regio. ISBN 80-239-1652-1. Hosák, Ladislav; Rudolf Šrámek (1980). Místní jména na Moravě a ve Slezsku II, M-Ž. Praha: Academia. Ludwin, Anna; Małgorzata Szarzec (June 2008). "Żydzi nad Olzą". Zwrot: 14–17. Spyra, Janusz (1999). "Zarys dziejów ludności żydowskiej w Cieszynie i okolicach, Żydowskie zabytki Cieszyna i Czeskiego Cieszyna". Wawreczka, Henryk; Janusz Spyra; Mariusz Makowski (1999). Těšín, Český Těšín na starých pohlednicích a fotografiích / Cieszyn, Czeski Cieszyn na starych widokówkach i fotografiach. Nebory, Třinec: Wart. ISBN 80-238-4804-6. Wawreczka, Henryk; Irena Adamczyk; Vlasta Byrtusová; Janusz Spyra (2001). Cieszyn wczoraj i dziś / Český Těšín včera a dnes. Český Těšín: Wart. ISBN 80-238-7590-6. "Zaolzie". Nowa Encyklopedia Powszechna PWN. VI. Warszawa: PWN. 1997. ISBN 83-01-11969-1. ^ Hosák et al. 1980, 587. ^ a b Wawreczka et al. 1999, 13. ^ a b Wawreczka et al. 1999, 10. ^ Ludwig Patryn (ed): Die Ergebnisse der Volkszählung vom 31. Dezember 1910 in Schlesien, Troppau 1912. ^ Wawreczka et al. 1999, 11. ^ a b "2001 census data". Czech Statistical Office. ^ "Polski Teatr Ludowy we Lwowie". Lwow.com.pl. 2011-11-20. Retrieved 2013-11-13. ^ "Polski Teatr w Wilnie - Polski Teatr w Wilnie". Wilteatr.lt. Retrieved 2013-11-13. Wikimedia Commons has media related to Český Těšín. * More than 10% of total population; 2001 census data. **Karviná fell under 10% in the 2001 census. Villages with significant Polish population under the administration of another municipality are not listed.